The arrival of summer signals long days, warm nights and the perfect season for adventure. 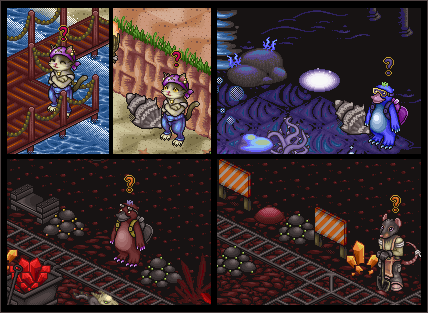 Your travels have led you to the Cove of Cinders, a tropical haven teeming with life. However, reports of volcanic activity and aggressive fire spirits have frightened away many explorers before you. You have been called upon to help fight off these spirits, uncover mysteries buried in the sands and protect the locals from danger. If you need help, open your backpack and click on the bottom right icon. This displays a list of help commands that explain how everything works in the dream. *Dig - Stand over a raised mound of dirt to dig. Make sure you don't have anything in your paws first. You can also click on the Shovel Icon in your backpack to dig. 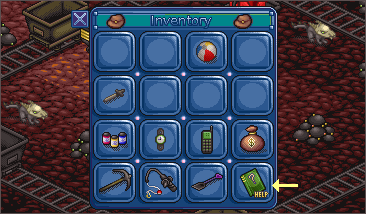 *Fish - Stand on a pier or bridge and say *Fish or click on the Fishing Pole Icon to catch a fish. Certain fish can only be caught at day or at night. *Mine - While inside of the Mine, stand on top of a mineral deposit and click on your Mining Pick Icon or say *Mine to gather ores. Boomer the Koala: Boomer is the first NPC you will encounter. He greets new guests to the cove and provides them with basic weapons to fight off foes in the area. Any time you're lost, give Boomer a call from the phone in your backpack and he will tell you where to go next. Ace the Koala: Boomer's brother, Ace, can be found above the tavern on the Southeast Shore. Ace needs help getting rid of Sand Thorns and found something curious in the sand that he wants to learn more about. Captain Bingle: The Old Sea Pirate, Captain Bingle, now lives a quiet life within the Cove. Often found inside the Tavern, he may share his story with you under the right circumstances. Sicily: The daughter of Captain Bingle spends most of her days wandering the beach looking for fish. She will gladly buy any fish you're able to catch. Paddles the Platypus: Young Paddles wants to be an explorer like his big brother Bill. He can be found in the Underwater Ruins digging for shiny treasure. Waddles the Platypus: Waddles spends most of his time in the back of the Tavern, stocking the food and drinks. Treasure Hunter Bill: Bill can be found in the Mine digging for artifacts buried deep in the earth. He will buy just about any that you find. Pete the Miner: The rat named Pete is usually very busy mining, but he will also buy ore from you to save himself time. Lady Ignacia: Lady Ignacia protects the inhabitants of the cove from the wrath of the Fire Spirits. Calm and kind for a phoenix who lives inside of a Volcano! Aster Axolotl: Aster can be found on the Northwest Shore playing with a beach ball. Maybe he'll share one with you! Trinity Thylacine: Trinity spends all of the day asleep because she is nocturnal. If you catch her at night, maybe she will share something shiny with you! Sicily the Cat: Found on the pier on the Southwest Shore and also outside of the Mine on the Northeast shore. She will buy fish from you. Paddles the Platypus: Found in the first portal to the right when you arrive Underwater. Paddles will buy treasures that you dig out of the ground. Bill the Treasure Hunter: Bill can be found inside the Mine, to the right of Pete. Bill also buys treasure that you dig up but has a little more gold to spend than Paddles. Pete the Miner: Pete is toward the back of the Mine and will happily buy ore from you. If you're looking for an item during a mission, seek out raised dirt mounds in the area. Stand over them and *Dig or click the shovel in your backpack. Raised soil can be dug through within the mine and underwater ruins. It's easy to get lost, don't be afraid to ask for direcitons! If you aren't sure where you should be during a mission, click on the phone icon in your backpack. When you call Boomer, he will point you in the direction of where you need to be and explain how to get there. Weapons also provide you with a defensive aura based on that weapon's element. Not all enemies will be hurt by all elements, so you may still need to carry potions and use your Basic Dirk on some foes. Keep your HP at a safe level with potions to save time. Fainting does not cause you to lose anything that you hold or have in your bags, but you will have to walk back to where you were. Even at the end of the series of missions, there are special items you can unlock. Some are bought from NPCs and others are found digging! Can you find them all? The time within Cove of Cinders runs on FST (Furcadian Standard Time). Time and date can be displayed by clicking on the watch in your backpack. Daytime begins at 7am FST and dusk falls at 8pm FST. Outdoor areas change to reflect the time of day, and so do a few NPCs. For example, certain fish can only be caught at night and others only during the day. Design, Text and Images © Tacoma & Lunati. 2002-2019.